Brian Rubin: Could you first off please explain Contested Space to those who haven’t seen the Kickstarter or your site? Matthew Haralovich: Contested Space is an online sandbox featuring action-oriented space combat in a persistent universe where every ship and station is designed by a player. I wanted to create a game where players had a lot of control over their appearance and the environment. The goal of Contested Space is to create these epic stories as different groups of players interact with each other. BR: You just launched a Kickstarter, which seems to be going pretty well (fingers crossed!). Could you elaborate on what you did to properly prepare for the launch of your campaign, and might you have any advice for others looking to launch their own? MH: First, you need a working prototype of your game. You must be able to prove you can deliver on the project’s goals, and it helps to have something concrete to show people. Second, you need to rally the support of your friends, family, and community. Those are the people who will be giving the campaign it’s initial push. Third, you need to have some traction with the community of gamers online. It’s difficult promote your Kickstarter campaign if no one has heard of your project before. BR: One of the taglines for the game is to “build a culture”. Could you expand upon that and what it means? MH: The primary purpose of Contested Space is to create stories. Narrative is driven by different people and cultures interacting with each other. I want to give players a lot of control over their identities. When a group of players get together they can collaborate with each other to create a unique culture. So when two player created societies clash it will be because both groups are fundamentally different. BR: You also say the game mixes, “action oriented ship combat with creativity and community.” Does that refer to being able to build ships and stations, for example, or is there something more to it? MH: A lot of online games are missing a deep sense of community. 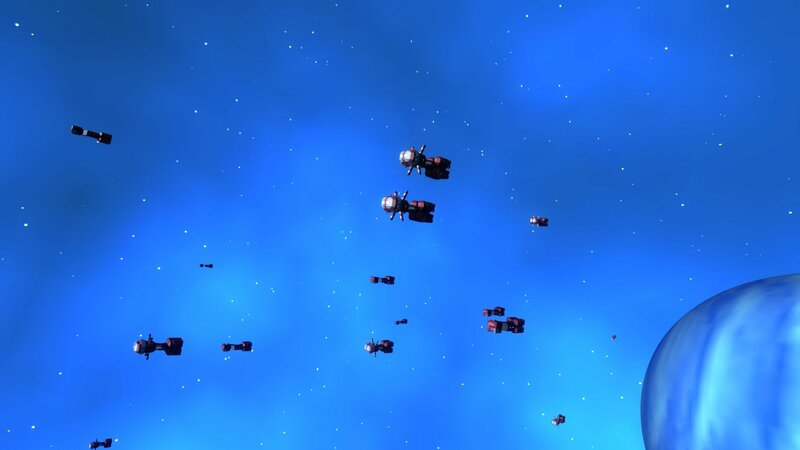 In Contested Space every station and ship is created by players. You might find yourself in a region of space with cool architecture and well designed ships. You’ll be more likely stick around and help this region because you’ll admire the people who play there. The design features in Contested Space allow players to create communities who share similar aesthetics and goals. BR: Could you tell us more about the three different factions you’ll be able to enlist with in the game, such as differences in ships, equipment and so on? MH: I decided to limit the game to three factions to help keep the game’s social mechanics simple at first. This was to make sure players could easily find allies instead of being thrown into a complex web of player created alliances. Do I hope to enable player created alliances, but it will be after the game has stabilized a bit. The three factions will be differentiated by the ship and station designs it’s members contribute. None of the factions will have access to unique building materials or equipment, but they will effectively be quite different. BR: Will a player be able to have characters in all of the factions, for example, or will they only be able to enlist in one per account? MH: Players will be able to switch between the multiple factions but I haven’t determined exactly how that will work yet. I want it to be easy for friends to play together even if they can’t agree on which faction is best. BR: Could you explain what kind of flight model the game has and how detailed ship control is, along with how differing designs will affect your ship’s performance, if at all? MH: The game uses Newtonian physics so ships have conservation of momentum and move through a frictionless environment. A ship’s speed and agility is determined by its mass, engine, and booster power. That said the game won’t be super picky about the ship’s shape or where exactly each booster is placed. The game strikes a balance between creative freedom and realism. Controlling a ship in Contested Space is novel compared to other space games. Your ship turns and accelerates relative to the position of the camera.You can move full speed in any direction without having to change where you’re looking. This lets you kite and orbit your targets and allows you to fully utilize the ship’s turrets. BR: It looks like this game also supports fleets. Are fleets all human controlled or can a player have AI fleets? Also, how does the player manage and give commands to these fleets? MH: Players will be able to form fleets. Fleet commanders will be able to set waypoints to help everyone know where to go and what to do. Cooperative play is very important to Contested Space and I want to make sure the game makes it easy for players to team up. I have been using bots in the early stages of the game’s development, but once the player base reaches a certain size there won’t be any AI combatants. When playtesting starts bots will be used to fill gaps in the player population. Bots just aren’t as fun as players. Bots be taken out of the game when they aren’t needed. BR: In the early version of the game, it’ll all be about territorial control apparently, so how can factions gain and lose territories, and how much work will be involved in maintaining their territories? Also, can a faction lose all of their territory? MH: Players will either capture stations by camping next to them king of the hill style, or they will destroy stations using heavy weapons. I haven’t decided exactly how territory will be captured. Part of early playtesting will be finding a good system and making sure that it works. The map in Contested Space will be flexible at any given moment. I want it to take around 15 to 45 minutes to siege a location in a one sided battle. However, a large planet might have a hundred locations around it’s orbit. So controlling all the areas around a planet won’t be trivial, and capturing a whole solar system for your alliance won’t happen every day. It will be possible for factions to lose all of their territory. I want to make sure that there are consequences in Contested Space. So when a faction is defeated it will be removed from the game and a new one will take it’s place. The new faction will be granted a quarter of the game’s territory and each player will be given a chance to join. BR: Now, the game is also being called a “role making” game. Can you expand upon what that means, please? MH: A lot of online games impose a pre-written narrative onto their players. You more or less play through the game’s script as it was written. Contested Space lets players set their own goals and act out their own stories. Role making is about providing players with an open ended set of tools they can use to create their own narratives. BR: Can you also expand upon the skill tree mentioned in the game’s website, and tell us how that works? MH: Characters in Contested Space will have a simple skill progression. The game won’t stop you from using any ship, weapon, or equipment. You’ll just be able to give a modest bonus to some of your ship’s characteristics. It’s intended as a reward to loyal players, but it won’t give you a significant advantage in combat. BR: How does the game handle social features? Can you form wings, for example, or squads? MH: You’ll be able to form fleets at first, and eventually the fleets will need to be subdivided into smaller sub-groupings as the game grows. At first social functionality will be simple, just friend lists and a way to search for allied fleets to join. BR: Eventually the game will become a sandbox, according to your Kickstarter, so will this allow players to take non-combat roles such as traders or miners, or will that be available at an earlier phase? MH: I’m going to be taking a similar approach to the economy compared to ship customization. I want to give players a lot of control over how they, research, manufacture, do business, and relate to each other. These features will come slowly after the initial game has launched and stabilized. I definitely want to provide players with non-combat roles eventually. Though I’m not a fan of hauling goods or shooting rocks all day. You’ll likely be hiring NPCs to perform those tasks if trading and mining are added to the game. Some things are little too boring for players. BR: What kind of infrastructure will you need to run this game with potentially hundreds or (hopefully) thousands of players? MH: Basically all I need is a cloud computing account and some carefully written software. Nowadays anyone can easily lease dozens of servers for a few hours and throw them away when they are no longer needed. On the software side Contested Space is written like a web application service with Unity clients and servers on the edge. Web developers have been producing cheap, effective, and scalable applications for years. I’m leveraging my experience in the web development industry to make Contested Space scale with a minimum of effort. BR: Even though the game is online only, will there be any kind of AI for players to interact with, like traders or pirates? MH: I mentioned the game will be using bots in it’s early development, but ideally everything dangerous will be piloted by a player. While bots might be used for some economic functions in the future nothing will happen unless a player is behind it. BR: Finally, how far along is the game, and when do you expect it to be ready for consumption? MH: I’m as skeptical as anyone when it comes to Kickstarter projects. So when I started working on Contested Space my first goal was to prove to myself I could deliver. Contested Space already has a working prototype. That’s how the Kickstarter video was made. Gameplay was captured using a computer running in Bloomington Indiana with a server running in Chicago. The game already has a working ship and station designer that backers are using right now. Each design is saved to a database online. The foundation of the game’s combat system is already in place, but it’s not yet ready for public use. However it’s possible to fight other ships and blow stuff up. The game also knows how to stream ships and scenery from the design database without slowing down the frame rate significantly. The game already knows how to distribute load to accommodate large amounts of players. Game physics are hosted on a series of Unity instance servers. As you warp from place to place you’re actually loading a new map and connecting to a new instance, but from your perspective it looks like everyone is in the same solar system. So with all that done we could be playtesting a month after the Kickstarter campaign. After that I’ll be aggressively implementing the features needed to release the game before the end of this year. We’ll be playtesting as I go to make sure everything functions correctly and is agreeable to most players. I’ve been working on this project part time for a year and a half. The Kickstarter campaign will fund at least 5 months of full time development. We should be able to get a lot done in that time.